Moscow is one of the world's most expensive cities and provides access to all possible types of entertainment for the rich and famous. This includes hotels suitable for those who can't imagine life without splendor and style, and who can afford to pay for such luxuries, of course. Presidents, international celebrities and even royals wouldn't hesitate to book a stay in one of these giant suites, with their luxuriously designed interiors and fantastic views. RBTH has chosen five examples showcasing the very best of Moscow hotels. This hotel itself is enough provides enough reason to visit Moscow because it’s a beautiful example of Art Nouveau architecture, built by the prominent British architect William Walcot. The façade itself is a masterpiece. There are fine majolica mosaics, and the biggest one, “Princess of Dreams,” was designed by the legendary Russian artist Mikhail Vrubel. Other talented artists also contributed to the interior of the hotel. In July 2017, the historic hotel completed a renovation of its luxury suites with both historic and modern interiors. These two suites are the most expensive and the most prestigious. They not only have a view of Tverskaya Square and the Bolshoi Theater, but they have also been the preferred residence of the most important and famous guests to the city since the hotel was built in 1899-1905. The three rooms of the Ambassador Suite contain interior details that date back to the late 19th century. It also has a piano that Michael Jackson played during his visit to Moscow in 1993. The two-room Premier Suite is slightly less expensive but also has antique decor. It is a great place, not only for a holiday, but also for official receptions and business meetings. Staying in either suite will get you access to the hotel’s Executive Lounge, which offers breakfast, dinner, snacks and unlimited drinks. Madonna, Rihanna, George Michael and Hugh Jackman used to stay at this hotel, which is located right behind the Bolshoi Theater. From its great rooftop restaurant, you can see the whole of Moscow laid out before you. But don’t be surprised to learn that the famous Hyatt breakfast, highly regarded by the glamorous young ladies of Moscow, is not included in the price of your penthouse stay. The renowned hotel designer Tony Chi, who previously worked on Park Hyatt rooms in Shanghai and Washington, has carried out the renovation of the hotel and designed the two-story penthouse. Hotel representatives highlight that the suite is a perfect place for cocktail parties and other luxury receptions. The suite is designed with many mirrors and reflective surfaces. It also contains a luxury bath and a Jacuzzi with a view of the Kremlin. To top it off, the French perfumer Blaise Mautin has created a special scent for the cosmetic line that has been specifically curated for this room. 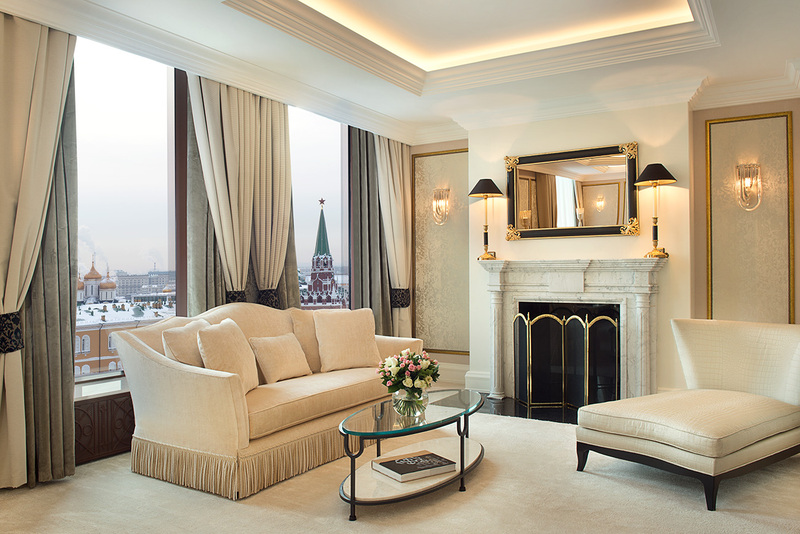 This new suite was added to the hotel after its recent renovation and its main advantage is the panoramic view it offers of Moscow’s city center – Red Square, the Kremlin, and St. Basil's Cathedral – everything is right there, and you can feel like you’re inside a postcard. Another perk is that the hotel is partnered with St. Basil’s so, upon request, guests can receive a personal tour of the church, including a visit to the bell tower. The whole area of the suite (a living room, two bedrooms, two bathrooms and a closet) is 125 square meters, but it can be expanded to up to six rooms at the guest’s request, according to a hotel representative. Another reason to stay at the Baltschug is that it is a historic building – the façade of the hotel dates back to 1898, and you can feel as if you are in a czarist, pre-revolution-era Moscow, but with the advantage of modern and innovative interior design. The hotel is situated in a historic area of Moscow on Baltschug Island. This hotel is probably the favorite for celebrities, who like to stay here and take pictures from the rooftop with its Kremlin view. The best and most expensive accommodation is on the 11th floor and provides the same stunning panoramic view as the roof with an oversized bedroom, oversized marble bathroom and even a personal sauna. The suite contains a living room with a grand piano and a fully equipped kitchen, but you probably won’t use it, because there is also 24 -hour room service and a concierge staff especially dedicated to serving the guests of this suite. All of these rooms are high-security. Another advantage of the hotel is that it’s right on Tverskaya Street, a five-minute walk from all the main sightseeing destinations and theaters. Located in the same building are several restaurants, including the famous Russian restaurant Novikov. The name of this suite tells you everything there is to know. This accommodation is not just luxurious, it deserves a royal guest. The hotel press release states that the classic interiors of the suite will make you feel like you are in a private luxury apartment. The suite is situated on the seventh floor and has three bedrooms with king-size beds, a living room, a dining room (that can seat 10 people) and a private terrace with a view of the Kremlin, Manezhnaya Square and Alexandrovsky Garden. There is also a private sauna and a guest bathroom. The hotel building is new, but it was built according to the design of the Hotel Moscow, which was located in the same place and was constructed from 1932-35. There is a legend about the asymmetric façade of the hotel: The construction team showed Joseph Stalin a plan of the future building with two versions of the façade on the same drawing. Stalin signed the plan without any comments and the builders were too afraid to choose just one of the designs, or to ask again, so they combined the sketches.